Energy, like food and water, is a necessity, which means that the poor and vulnerable spend a much higher proportion of their income on energy than do their rich neighbours. Increases in fuel prices therefore hit the vulnerable in a disproportionately harsh way. Energy suppliers incur significant fixed costs in laying the pipe/wire to the home, providing a meter, meter reading and so on. Tariffs which reflect these costs must therefore include high costs per unit of energy on those who consume smaller amounts of energy - who are generally the poor and disadvantaged in society. Politicians are increasingly looking to energy users to pay more for sustainable and secure energy supplies, thus increasing the cost of energy for everyone - including the vulnerable. One problem, of course, has been that successive governments have taken policy decisions which have sharply increased the cost of domestic energy. But the poorest in society have been hardest hit. The following charts summarise what has happened. 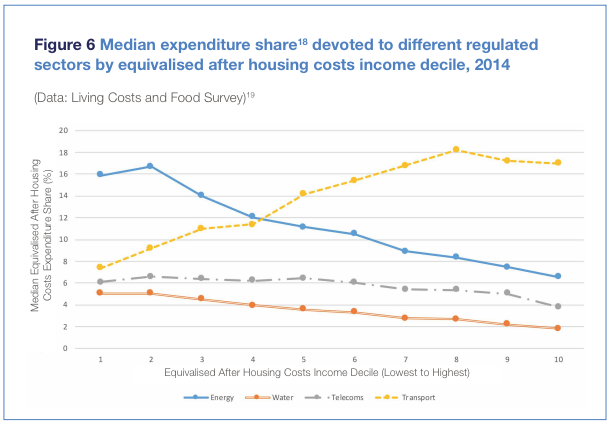 This first chart shows that the highest earners in UK society spend around 6.6% of their income (after housing costs) on energy., whilst the poorest decile (10%) spend 16%. Even small increases in energy bills can devastate their budgeting. For added emphasis, this next chart shows how the various income deciles spend their money. 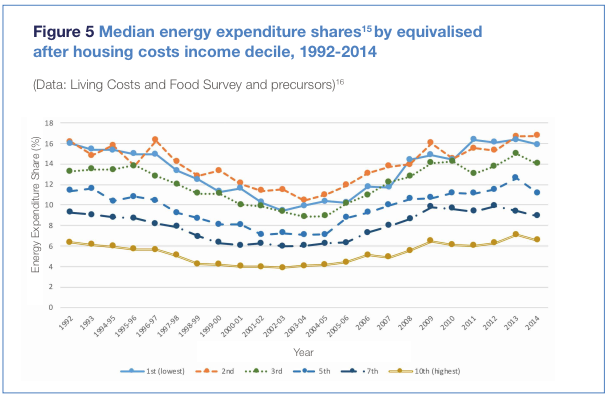 Energy is absolutely the largest utility cost for poorer households. The rich seem to spend most of their money on transport - presumably commuting, posh cars and weekends away, all of which consume energy in ways not caught by the above chart. The 2002 liberalisation of the market added new problems, in that the retail industry became concentrated in the hands of only 6 suppliers (British Gas, EdF, E.ON, Npower, Scottish & Southern, and Scottish Power). There was little or no new entry and the complex new tariffs - with cheap deals aimed at those willing to switch suppliers - were soon perceived to be confusing and obfuscatory rather than liberalising. Those 'switchers' who shopped around and switched suppliers found that they could often save 10% of their energy bills, but many consumers - and particularly vulnerable consumers - failed to switch and were thus in effect penalised yet further. The pressure slowly grew to do something to help those vulnerable customers, whose behaviour happened to be indistinguishable from those who couldn't be bothered (or were too well-off to be bothered) to shop around. Eventually, in 2008, Ofgem decided that they would impose non-discrimination clauses on the energy companies - i.e. force them to offer the same prices to switchers and non-switchers. Unfortunately, however, this decision was forecast by some to have the perverse effect of reducing the competitive pressure on all 6 companies. This was because the companies would know that there was now very little to be gained by reducing prices in order to attract new customers, as such price reductions now have to be offered to all their existing customers, at great cost to the bottom line. Even worse, such price reductions would probably be copied by competitors and so might not attract any new custom at all. All in all, therefore, it then made less sense for a company to compete by lowering its prices. The regulator thus chose to help the vulnerable (as well as those who can't be bothered to shop around) by promoting equal treatment between customers - but at the expense of effective competition and hence lower prices for all. It could even be that the vulnerable would end up paying more for their energy than before - but at least they would have the satisfaction of paying the same as everyone else! Eventually, in 2012, Ofgem decided to ditch non-discrimination clauses as there was indeed increasing evidence that they stifled competition. There is a separate but related concern concerning the generous discounts - often totaling around £100pa - that can be claimed by those who pay their bills by direct debit and operate their accounts online. Some see this as discrimination against 'sticky' customers - those with poor access to credit who are less likely to shop around. Ofgem have not decided to attack these discounts, but their scale was reported to have fallen following Ofgem's introduction of non-discrimination licence clauses. Subsequent political pressure to 'do something' to help those unable or unwilling to shop around for their energy are reported elsewhere on this website (see here for instance). Eventually, in July 2017, Ofgem announced that it was considering introducing a safeguard tariff (price cap) for vulnerable customers which would protect them from overpaying for their energy. It was likely to be in place by January 2018. Ofgem subsequently announced that the cap would be extended in scope and time, through to at least the Spring of 2019, and possible for many years thereafter. In the event, the January 2018 target was missed, leading to Ofgem's Chief Exec apologising to MPs and losing his bonus of £15,000. The government subsequently forced Ofgem to impose a much broader price control on all single variable tariffs (SVTs). Dr Caitlin Robinson published a blog in early 2019 discussing the slow progress in addressing fuel poverty in the UK. There is much more detail and analysis in Fairness in Retail Energy Markets - a joint report by UEA''s Centre for Competition Policy and the UK Energy Research Centre.